Valve's Gabe Newell joins the prestigious company of Ralph Baer, Alex Rigopulos, and Eran Egozy as the 2010 winner of the Game Developers Choice Awards Pioneer Award, honoring breakthrough figures in the game industry. Ralph Baer, winner of the 2008 Pioneer award, is widely considered to be the father of video games. Alex Rigopulos and Eran Egozy founded Harmonix, scoring them the 2009 Pioneer. 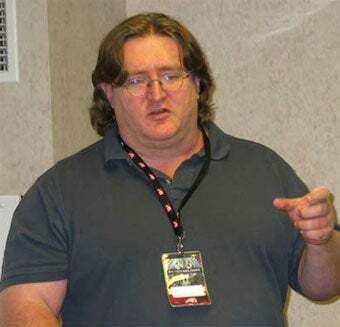 What did Gabe Newell do to earn the accolade in 2010? Gabe scores the award for not only having a hand in creating some of the most influential video games of all time (Half-Life, Portal, Team Fortress), but also for his work in co-creating Steam, the service that revolutionized digital distribution. Newell will be on stage at the 2010 Game Developers Choice Awards at GDC in March to accept this honor, and Kotaku will be there, passing a tissue box back and forth as we weep with joy. We always get emotional at these things.